Humans have always been explorers, and have long dreamt of travel to distant worlds. But to colonize Mars? Elon Musk isn't alone in thinking it's a good idea1. There has been a big push recently to send humans to Mars for exploration, understanding, and the possibility of new habitable places, but also a number of very difficult hurdles to get over in trying to do so.2-7 Among the most challenging issues is keeping humans and equipment safe from ionizing radiation. There are a number of different types of ionizing radiation, and a number of different ideas for protection, but none has quite met all the criteria for space travel. Maybe you'll have some ideas to contribute after reading this! Ionizing radiation has enough energy to knock an electron off a neutral atom, resulting in two charged particles: the negatively charged electron that was knocked off the atom, and an ion—an atom with a net charge, in this case a positive charge. Ionizing radiation consists of particles either with mass, or of massless bundles of electromagnetic energy called photons. The photons that let us see light and color are too low in energy to cause ionization, but beyond the visible spectrum there are things like gamma rays, X-rays and ultraviolet light. Each of these carries enough energy to ionize an atom, and can be harmful to human cells. Because the energy of light comes in discrete packets, even a very bright light won’t cause ionization, if the energy of the individual photons—the color of the light—isn't high enough. Massive particle radiation is usually emitted as a result of nuclear processes. Nuclear processes involve interactions within the nucleus of an atom, such as beta decay and alpha decay, which produce very energetic charged particles. Beta decay produces electrons or positrons (an antimatter particle like an electron, but with positive charge) and alpha decay produces bare helium nuclei: bundles containing two protons and two neutrons, without any electrons attached. Charged particles can cause ionization by electric forces as they pass through material. Electrons pass into material rather easily since they are so small, but alpha particles are larger and very charged, tending to interact with the first layers they reach. For humans, alpha particles created in common reactions on Earth don’t pose much threat; they rarely make it through our outermost layer of dead skin cells. However, if ingested, materials that produce alpha particles can be fatal—as in the well-documented poisoning of the former Russian spy Alexander Litvinenko. This graphic shows the penetration abilities of alpha particles (α), beta particles (β), and photons (γ). Radiation consisting of neutrons only interacts with nuclei, since neutrons are uncharged. Energetic neutrons cause more damage than electrons or alpha particles because they cause nuclear reactions that produce secondary ionizing radiation. Charged ionizing radiation can also cause secondary reactions, multiplying the amount of damaging radiation produced. In this image, an alpha particle (α), a beta particle (β), a photon (γ), and a neutron (n) interact with matter. The energy required to ionize an atom is of the order of tens of electron volts (a unit of energy). In a typical reaction producing ionizing radiation on Earth, the ionizing particles have energies of the order of millions of electron volts (eV). This means that a single particle of ionizing radiation has enough energy to ionize many atoms (up to hundreds of thousands). As the energy of the ionizing radiation increases, it becomes harder to stop, and has the potential to do even more damage. Further, if you try to stop a charged particle, secondary radiation in the form of photons is produced. This occurs anytime a charged particle changes its speed or direction, and the photons produced are more energetic the less massive the particle. For example, an electron would create higher energy photons than a proton or alpha particle of the same energy would. The photon energy radiated is proportional to 1/(mass)4 for angular accelerations (synchrotron radiation), and 1/(mass)6 for accelerations in the direction of motion (for example, "braking radiation"). When ionizing radiation interacts with a human cell, the cell’s DNA—the blueprint that lets it create the molecular machinery of life—may become damaged. Often the body can repair a cell, or replace it if it dies. However, if many are damaged or die, the body may not be able to replace the cells fast enough, causing radiation poisoning and death. Cells may also be damaged in such a way that they do not properly perform their function, and may become cancerous. Cells that are most likely to become cancerous are ones that are most likely to divide. For example, radiation exposure in children has a higher probability of causing cancer than in an adult. For more about the basic effects of ionizing radiation on humans, see reference 8. Ionizing radiation passing through structural materials such as metal makes it brittle and can weaken the material if the radiation's intensity is great enough. It can also damage electronic equipment. Great care must be taken to shield sensitive electronics on satellites, space probes, and space vessels to assure proper function. Even greater care must be taken in shielding humans during interplanetary travel, where ionizing radiation is far more dangerous than here on Earth. Space travel requires addressing three categories of ionizing radiation: Galactic Cosmic Radiation (GCR) created during supernovae, Solar Cosmic Radiation (SCR) primarily from solar wind and solar flares, and the radiation trapped in the Van Allen Belts around Earth. Earth’s magnetic field keeps our planet safe from most ionizing radiation, including Galactic Cosmic Radiation (GCR) and Solar Cosmic Radiation (SCR). Van Allen Belt radiation is radiation trapped in the magnetic fields that surround Earth. Scientists and engineers have found ways to minimize exposure to radiation in the Van Allen Belts (primarily by avoiding their strongest regions), and although not ideal yet, continue to find better ways to deal with radiation from solar flares and the solar wind. The most difficult radiation problem for space travel is radiation with high energies and radiation with high fluxes (many ionizing particles per second). The solar wind has low-energy particles of about one hundred electron volts per particle, so each could possibly ionize a few dozen atoms. This is not of great concern. What makes this radiation problematic is that it has the highest flux of the three sources, about 10 billion of these particles per square centimeter each second. Each particle itself cannot do so much damage, but there are so many of them that the added damage is of definite concern. Solar flares have between 1000 particles per square centimeter per second with energies in the ten millions of electron volts, up to particle fluxes of 1 per square centimeter per second with up to 100 million electron volts. Each of these higher energy particles has enough energy to ionize of the order of 10 million atoms. Even so, scientists have figured out pretty good ways to deal with this type of radiation, which consists of putting matter between the radiation and the instruments and people. For big storms astronauts go into radiation shelters (like storm or bomb shelters). The most damaging particles come after an initial indicator, so astronauts have time to get into a shelter. For example, astronauts in the International Space Station (ISS) took cover in their shelter during a solar flare in September 2017. Galactic Cosmic Radiation consists of particles, coming equally from all sides, which range from electrons to heavy nuclei such as completely ionized iron—with 26 times the charge of a proton and about 56 times the mass. GCRs have energies between 100 million to 10 billion electron volts, and are the rarest type, with fluxes between one per ten square centimeters per second and one per square meter per second. 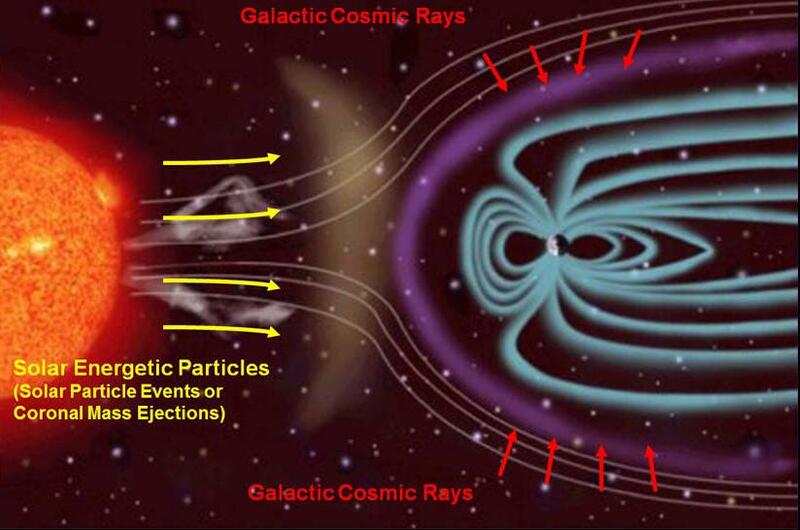 Although galactic cosmic radiation is sparse compared to solar radiation, it is so energetic that one of these particles can tear through material, causing multiple nuclear reactions and creating a large amount of secondary radiation along the way. Remember, it only takes a few electron volts to ionize an atom, and GCR particles easily have a billion times more energy than needed. Galactic Cosmic Radiation particles include High Atomic Number Energetic (HZE) particles that are massive, very charged, and moving very close to the speed of light. For example, GCR contains completely ionized iron traveling at 0.9998c where c is the speed of light in vacuum—this is about 299,940,000 m/s. These particles, effortlessly created in large stellar explosions known as supernovae, are the most dangerous. If one of these particles strikes a human, it will destroy cells in its path of travel for centimeters or more before slowing down, and create secondary radiation, propagating outward, destroying more cells. Damage in the outward direction will be less severe than in the forward direction of travel. Below is an information chart prepared by NASA about types of radiation and the acute and chronic effects radiation can have on humans (click to enlarge). Scientists and engineers have been working for decades on how to protect humans and equipment from radiation. It remains one of the hardest problems to solve. Some promoters of space travel feel that allowing an increased risk of cancer is not an issue, but this attitude is unusual. Even airlines are concerned about the increased radiation doses from travel, and prefer travel routes with lower radiation (away from the pole regions).9 Most space agencies are very concerned with the risks of radiation, and the effect radiation might have on an astronaut’s ability to function on an extended mission. For travel to Mars, radiation on the planet surface is not as much of a concern because a shield of Martian soil could be built, creating an underground station. It is getting through the radiation on the journey to Mars and back that is the problem. Currently, there are four main types of shields for radiation: mass, electric fields, plasma, and magnetic fields. Mass shielding is passive in that it absorbs the radiation and shields based only on the material characteristics of the matter being used. Active shielding requires energy sources to maintain the shield, and includes plasma, electric fields, and magnetic fields. In previous missions, the common way radiation has been dealt with is passive mass shielding. Mass shielding is the same as the lead blanket used during an X-ray: The material absorbs the radiation and any secondary radiation that might be produced. The material selected must be chosen taking into consideration the different types of interactions that can occur with energetic particles striking it, its structural integrity, and its density. As the incident particle strikes the material, the energetic particle may lose its energy by ionizing many atoms of the material. This interaction depends directly on the energy of the particle and inversely on its charge. Hence a higher-charge particle will slow and “dissipate” its energy into the material more rapidly than a low charge particle of the same energy, like the alpha particle stopping at skin depth described above. A charged particle interacts with an electric field by linearly accelerating (speeding up or slowing down) along the field line in a way dependent on its type of charge. The idea behind an electric shield is to use an electric field to reflect positively charged particles and bring in and trap negatively charged particles (electrons). The estimates on the amount of energy needed to create the very large electric fields vary. A small sized system was created and tested for a satellite, finding that positive charges produced neutrons and energetic gamma rays as a result of interacting with the material creating the electric field, and the electrons produced energetic X rays. Uncharged radiation, such as neutrons and photons, would be unaffected by the field and secondary radiation in the form of photons would be proportional to 1/(mass)6 of the charged particle being accelerated. Other issues arise as well, such as charge building up within the shield, high voltages needed for a shield that would surround a ship, and safety with ship propulsion systems. An electric shield was successful in a test on a Russian satellite, Kosmos 605, however, it is not clear that this approach will scale well to the size of a ship. This method of shielding has largely been abandoned. A plasma is a neutrally charged substance in which unbound electrons and their former nuclei exist, each with high energies. A plasma shield involves both electric and magnetic shielding techniques. With this shield, a cloud of electrons would be contained by a magnetic field. Incoming energetic electrons would be forced to follow along magnetic field lines, and incoming positive particles would be deflected, with a field lower than that needed without a plasma. This is similar to Earth’s protection by its own magnetic field and the Van Allen radiation belts, created as charged solar wind particles get trapped within the field. This method seems promising, but there are difficulties with trapping and deflecting highly energetic particles, and maintaining a plasma. 10. European Space Radiation Superconducting Shield (SR2S) Project.